This past August I had the good fortune to interview Takashi Watanabe, founder of Toziba, an innovative non-profit that is one of the most sock-rocking food-farm-community organizations out there. We first met at an Eco+Waza event in January where I was deeply impressed by his story and the motivation for founding Toziba. (I do write for Eco+Waza's website and magazine, by the way.) Munching on early edamame from the farm, I recalled meeting him and decided he'd be an interesting person to interview. 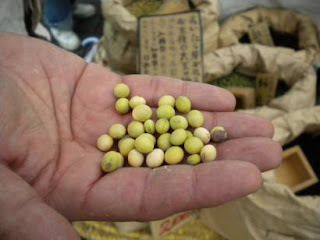 And, so, with the help of a good friend translating we sat down at the Earth Day Market and talked about soybeans (daizu), the importance of heirlooms, and the effects of March's triple disaster on food and how people in Japan are thinking about food. You can read the full article over at Real Time Farms, another sock-rocking food-farm-community organization, for the full scoop.